4) Don't Water Your Plants in the Middle of the Day: How many times have you heard that? "Only water your plants in the early mornings or late evenings." THE CHALLENGE: That's easy to say, but not always easy to do. Do you have time in your busy schedule to water at these "optimal" times? I especially loath the "early in the morning" recommendation. If you have a full time job you might know what I mean. And the "late evening" hardly seems like an advantageous time. Mosquitoes are most active. And plant foliar diseases are more likely (see below). WATER CONSERVATION: Water will evaporate faster in the intense, mid-day sun. And so the soil surface tends to dry faster. But if water conservation is your prime concern, why not focus on applying a layer of mulch to the soil of your garden bed? 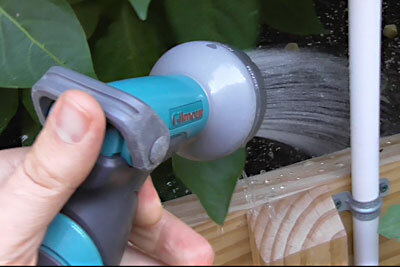 This will reduce soil evaporation, no matter what time of the day you water. Installing a drip irrigation system would be an excellent option. A timer could be used to water automatically, at just the right time of day. Or would a self-watering planter be a good fit for your garden? When you water the reservoir of a sub-irrigated system, the water is pumped straight down to the bottom. No waste! LEAF DAMAGE: I've read that watering plants at mid-day will "burn" the leaves of plants. That's a big reason we should wait until late evening. I've personally never observed such damage. Furthermore, researchers have found this to be a common garden myth in most instances. This is only plausible on plants that have hairy leaves. Even still, it's a good idea to avoid getting the plant leaves wet when watering. Minimizing leaf spray might reduce salt exposure and cold water shock. But in particular keeping leaves dry can reduce fungal and bacterial disease. Could watering in the mid-day be beneficial? The warmth of the day will help to evaporate any water that unavoidably splashes onto your plants. Isn't that better than having the water resting on the leaves all night long, encouraging pathogens? The bottom line: Preventing water stress is crucial. If I see that plants need watered, I'm going to do it immediately. By having flexibility of watering when it's convenient for me, my plants will actually get that water when they need it!